ORANGEBURG, SC (courtesy claflin.edu) — U.S. News and World Report Short List ranked Claflin University fifth on its list of the nation’s top 10 colleges and universities in alumni giving percentage during the 2014-2015 and 2015-2016 academic years. In that period, the 10 institutions with the highest percentages of undergraduate alumni donors boasted an average giving rate of 51.5 percent. Princeton University is ranked first with 60.8 percent alumni giving. 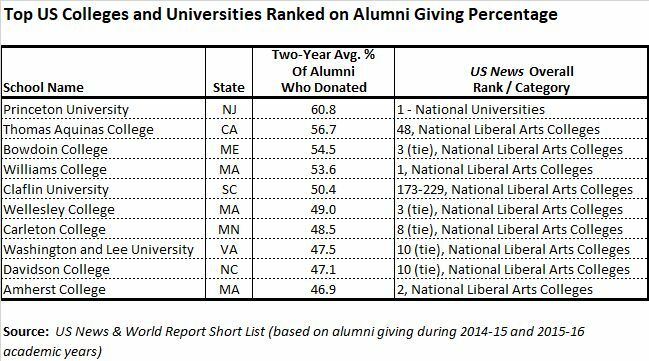 Only Princeton, Thomas Aquinas College, Bowdoin College, and Williams College rank higher than Claflin on percentage of alumni giving. In comparison, among all the institutions that reported alumni giving data to US News, the average was only 11.6%. Below is a list of the 10 schools – nine of which are National Liberal Arts Colleges – with the highest two-year average percentage of undergraduate alumni donors in 2014-2015 and 2015-2016. The US News & World Report Short List: Colleges, the source for this ranking, may be viewed here.